Strengthening Colorado’s critical infrastructure (roads, water, telecommunications and energy). 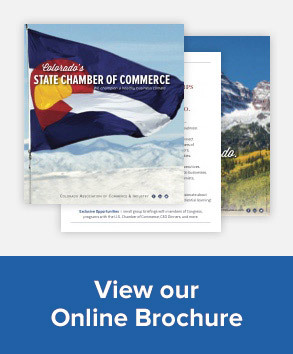 The Colorado Chamber is the only business association that works to improve the business climate for all sizes of business from a statewide, multi-industry perspective. What The Colorado Chamber accomplishes is good for all businesses, and that’s good for the state’s economy. The Colorado Chamber was created in 1965 based on the merger of the Colorado Chamber of Commerce and the Colorado Manufacturers’ Association. As a private, non-profit organization, The Colorado Chamber’s work is funded solely by its members.